We dry farm, which conserves water usage while creating a deeper flavor with a higher mineral and vitamin content. Using techniques as old as the art of cultivation itself, we work to prevent soil erosion and maintain the deep fertility of Shively’s soil. Cover cropping, rotation, and leaving land fallow is done seasonally. Perennial native borders sustain biodiversity and habitats. Many of the open pollinated varieties that we grow have been passed down to us from Shively organic seed producer Bill Reynolds. We now produce our own supply of seeds every year from these regionally adapted varieties. We recycle and re-use packing materials and use minimal packaging. 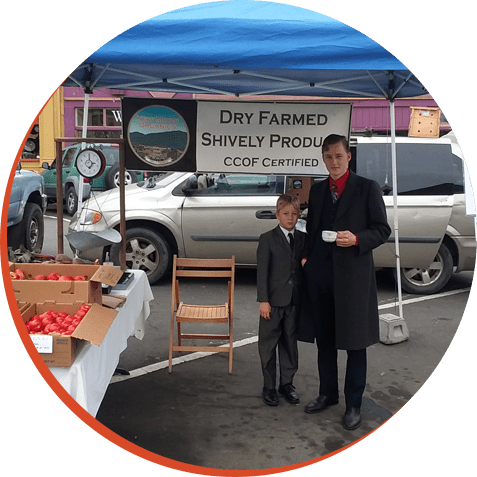 We market and sell locally at grocery stores and restaurants including Eureka Natural Foods, Monterey Market, Berkeley Bowl, Café Brio, 511, and Chez Panisse, as well as Good Eggs delivery service. Veritable Vegetable and Green Leaf are our local wholesale distributors. You can also find us at the Garberville and Arcata Farmer’s Markets.